LynchyRightNow: That Is How You Fix A Mess! One year ago entering week 10, the Atlanta Falcons were a dismal 2-6. Their franchise player and starting quarterback, Michael Vick, was headed to prison. Their first year head coach, Bobby Petrino, was contemplating a return to college football after just months in the NFL. All the while owner, Arthur Blank, was most likely getting zero hours of sleep and wondering what the hell had happened to his franchise that had finished just 7-9 the season before. The Falcons would finish 2007 with a 4-12 record, losing 6 of their final 7 games. If all that wasn't enough for Blank and the Falcons, the start of the off season wouldn't go any better. The ever ruthless, Bill Parcells, would use the Falcons and their desperate owner as leverage for his move to South Florida. The Tuna hooked Blank into a meeting and floated it out that he would accept a position with the Falcons; only to cancel at the last minute and jet to Miami to become the Executive Vice President of football operations with the Dolphins. The franchise that once showed more promise than any other in the NFL was now left for dead. It's a year later, the day before America selects their 44th president, and those very same Atlanta Falcons, with their very same owner at the helm, are 5-3. They've beaten Green Bay at Lambeau, thrashed Oakland in the Coliseum, and beat the Chicago Bears in one of the seasons most memorable finishes. Back from the dead they are, faster than Martha Stewart after her 5-month stint in federal prison. How has a team, just a year removed from their lowest point in franchise history, made this giant leap? 1. January 2008, Falcons bring on Patriots director of college scouting, Thomas Dimitroff, to become their new general manager. If your looking to evaluate talent and not repeat mistakes of the past, you can't get much better than Dimitroff. The five year Director of College Scouting for the New England Patriots has scouted and evaluated during two separate Super Bowl seasons and of course last years 16-0 undefeated regular season. He'd evaluated such stars as Patriot Pro Bowl linemen, Logan Mankins and Dan Koppen. Defensive Pro Bowlers, Vince Wilfork and current Eagle Asante Samuel were also drafted during Dimitroffs tenure. For a Falcon franchise that has drafted such stars like the incarcerated Michael Vick and current Raider problem child, DeAngelo Hall, Dimitroff should bring a breath of fresh air to the with his selections from the draft day war room. You don't do better than a guy who has learned under future Hall of Fame coach, Bill Belichick and three time NFL executive of the year, Patriot vice president of player personnel, Scott Pioli. 2. 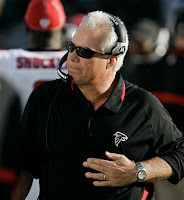 Days after the Falcons introduce Dimitroff, in comes new head coach, Mike Smith. The former defensive coordinator of the Jacksonville Jaguars had been working with the likes of Jack Del Rio for the past 4 seasons, over which time the Jaguars compiled the sixth most wins of any team in the league. Smith has been called a no nonsense type of guy, and to be a part of the coaching staff that masterminded the 2000 Baltimore Ravens Super Bowl squad, you need to be. Smith has consistently lead top 10 NFL defenses throughout the regular season, including coaching up all-world linebacker, Ray Lewis, Patriot linebacker, Adalius Thomas, and hall of fame defensive back, Rod Woodson. He and general manager Thomas Dimitroff have brought on reputable offensive coordinator, Mike Mularkey and former Georgia Bulldog defensive coordinator Brian VanGorder. After suffering under the likes of Bobby Petrino, notorious for his inability to communicate with the pro players, Mike Smith is the right guy to get to these players and teach them to finish out football games, just watch how the Falcons played in the fourth quarter in each of their three losses this season. Furthermore, it wasn't a surprise that just over a month after the Falcons brought on the new head coach, embattled defensive back DeAngelo Hall, was sent packing, dealt to the Raiders for a second round pick in last Aprils draft. A clear sign that Dimitroff and Smith won't be putting up with players not on board. 3. Early March: Find a weapon, a game changing weapon, in the form of 4th year rusher, Michael Turner The Burner acted as backup to All Pro running back, Ladanian Tomlinson for 4 seasons in San Diego. He played in all 16 games twice and at least 13 in the four seasons, proving his stability in the position. In 2006, Michael Turner rushed for over 500 yards on just 80 attempts averaging upwards of 6 yards a carry. Turners' signing with the Falcons stated a couple things to the people watching the organization; The Warrick Dunn era in Atlanta was finished, the twelve year NFL veteran was turning 33 and his numbers were beginning to decline in each of the last three seasons; Secondly, the Falcons are determined to rush the football, Turner would be paired with Jerious Norwood, the third year running back from Mississippi State, this attack gives Atlanta a fast and powerful backfield. Finally, signing Michael Turner gave draft analysts everywhere something else to chew on, their 3rd pick overall wouldn't be spent on Darren McFadden. The Falcons were either going defense, or prepared to select a quarterback as high as number three, eliminating out all possibilities of a Michael Vick return to the Dirty Dirty. The result: Turner has hit the century mark in 4 of Atlanta's 5 wins, he's closing in on 1,000 yards and were only at the half way point in the season. Looks like they found that game changing weapon. 4. 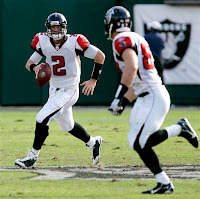 The 2008 NFL Draft, build a franchise quarterback.. With the third selection in the 2008 NFL draft, the Atlanta Falcons select Matt Ryan, quarterback, Boston College. Ryan is the polar opposite to Michael Vick. He's a pocket passer, willing to hang in and take the hit after hit without being rattled, interceptions don't phase him from play to play, in short, he's got gigantic moxy under center. After years of watching Vick revert to his legs to get yardage, the Falcons have a new plan, utilize their entire playbook. Big game receivers, Roddy White and Michael Jenkins give Ryan targets, targets that are more than happy to have a quarterback that will deliver them the ball first rather than take off out of the pocket. The genius doesn't come from drafting Ryan at third and making him one of the highest paid rookies of all time, it comes from putting the people around him to make him worth it. A strong rushing attack takes pressure off of Ryan, allows him to both manage the flow of the game and learn the NFL game at the same time. Drafting USC tackle, Sam Baker, with their other first round pick shows a commitment to Ryan by protecting him. Between head coach Mike Smith and the entire staffs play calling, to fit both Ryan's strengths and the strengths of the people around him, that is why his name is floated out as a potential pro bowl quarterback in his first season. More importantly however, the Falcons have made Bill Musgrave their quarterbacks coach. Musgrave has worked with quarterbacks Mark Brunell while at Jacksonville, Matt Schaub, former ACC Player of the Year, while Offensive Coordinator at the University of Virginia, and Steve Beuerlein, when Beuerlein was a Pro Bowl quarterback in 1999. He was also a former NFL quarterback himself, backing up the likes of Steve Young, Joe Montana, and John Elway for coaches like Mike Holmgren and Mike Shanahan. The Falcons haven't thrown Ryan into the fire without a hose, they've given him everything one can possibly give a rookie quarterback on a 4-12 team the season before he arrived, and boy has he thrived. In his last three starts, Ryan has averaged 266 yards a game, thrown 5 td's and only two interceptions. The man has gone into Lambeau field and beaten the Packers, he's beaten the Bears with zero seconds on the clock, any doubters? The 2008 Atlanta Falcons have become the darlings of the NFL, maybe Arthur Blank made a deal with the devil that we have yet to find out about, but a year after one of the most dissappointing blows to any franchise, the Atlanta Falcons are storming back, and I couldn't be more happy for them.